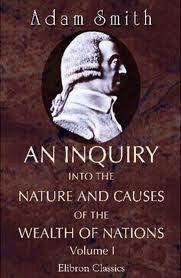 Wealth of Nations Research Papers overview the book by Adam Smith on his economics philosophy. Adam Smith published his famous treatise on economics, The Wealth of Nations, in 1776. Because this book was the first to demonstrate the ways in which an economy worked as a unified system, he became widely recognized as the father of modern economics. Although Smith was writing from an eighteenth century perspective in which mercantilism was dominant, many of his ideas are still apparent in society today. A research paper on The Wealth of Nations by Adam Smith will examine a selection of Smith's writings to demonstrate the role of self-interest in The Wealth of Nations. This discussion will demonstrate that many of Smith's ideas regarding self-interest are relevant in today's daily economy. These issues and attacks government for its role in this failed economy. Wealth of Nations research papers report that Adam Smith wrote The Wealth of Nations for many reasons, among them to record his disgust with the chicanery which the merchants and manufacturers practiced". Unlike mercantilism, Smith believed markets should based on the free expression of individual self-interests. Smith's belief in free competitive markets is at the heart of his economic philosophy, just as it is at the heart of many economic policies today. He believed that economic growth followed from competition, and that competition was typically dependent upon people and their self-interests. In fact, Smith contends that it is this self-interest that motivates the economic process of buying and selling. Human Capital Theory - Human Capital Theory research papers examine the part of economics that include the ability to perform labor as a production of economic value. John Stuart Mill - The following year he began reading Adam Smith. However, he had a nervous breakdown at the age of 20. Laissez Faire Capitalism - The idea spread throughout the Enlightenment, espoused by thinkers such as Adam Smith and Jeremy Bentham. Economic Thought - Economic Thought research papers report that “economics” came into being as a particular field in the eighteenth century. Paper Masters writes custom research papers on Wealth of Nations and overview the book by Adam Smith on his economics philosophy.